With the warmer weather upon us one of the most common calls I receive is one mentioning the above issues. 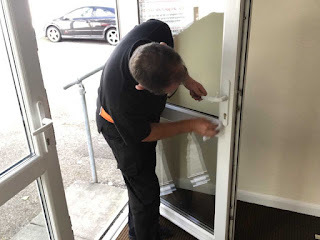 I recently completed a multi-point locking system replacement for a customer who called Lockforce Locksmiths Southampton and after one week when the warmer weather struck I had a call back mentioning the door struggled to open freely. I reassured the customer that all work carried out by Lockforce locksmiths in Southampton carries a one-year warranty, however I also mentioned that the issue would not be down to the new locking system I installed but it was the sudden change of temperature expanding the Upvc doors themselves. I arranged to pop around that morning free of charge (as it’s part of the service when you choose Lockforce Southampton). I then adjusted all the multipoint locking rebates, so the door closes freely. As part of the service being your local community locksmith, I showed the customer how to adjust the rebates so later, when the weather changes for the colder, he can adjust the system back to its original state.